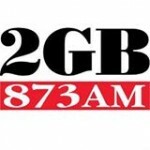 2GB 873 is Sydney’s premier talk radio station. 2GB 873 AM is one of the most famous online radio station in Australia. 2GB 873 AM broadcasts talk, news. 2GB 873 AM is live broadcasting from Australia.